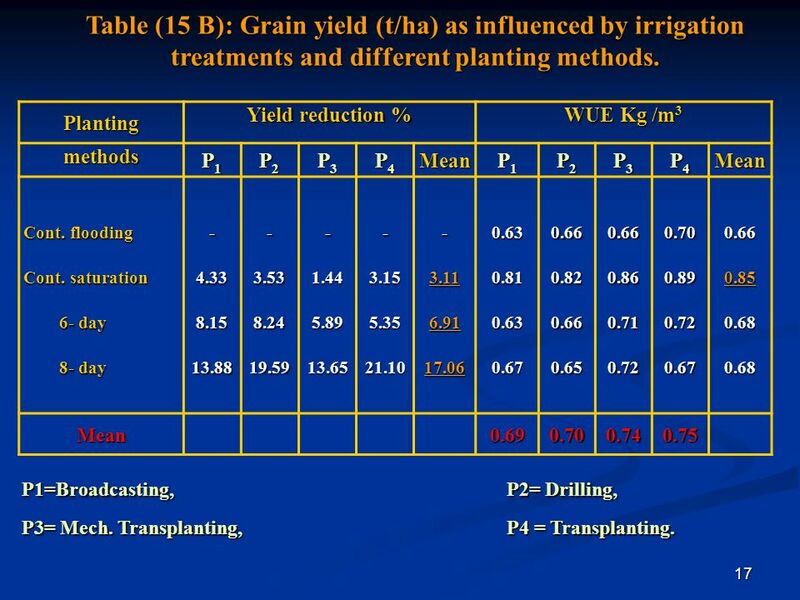 2 Table (1): Actual consumptive use (Eta) and water requrment of the rice and its component as will as potantial evapotranspiration in mm /day as calculated by different methods. ETp Eta (E+T) W.R mm C.U P mm/day T E mm/day Period (day) Pan Blaney & Criddle Penman 4.87 4.14 4.20 3.23 2.21 6.21 6.01 4.94 4.18 2.72 6.94 6.14 4.78 3.75 2.50 7.77 8.04 5.84 3.94 2.51 524.61 489.49 340.80 234.36 58.80 209.79 249.24 175.20 122.14 25.10 11.66 7.75 5.52 3.62 3.37 2.95 3.54 2.92 1.46 0.78 4.82 4.50 2.48 1.73 July (27 day) Aug.(31day) Sep.(30 day) Oct. (31 day) Nov. (10 day) 508.1 658.9 662.4 781.4 781.47 866.59 Total (129 day) The varity used Giza E = EvapoTranspiration (mm/day), T = Transpiration (mm/day), P= Percolation (mm/day), C.U = Consumptive Use (mm), and W.R = Water Requirment (mm). 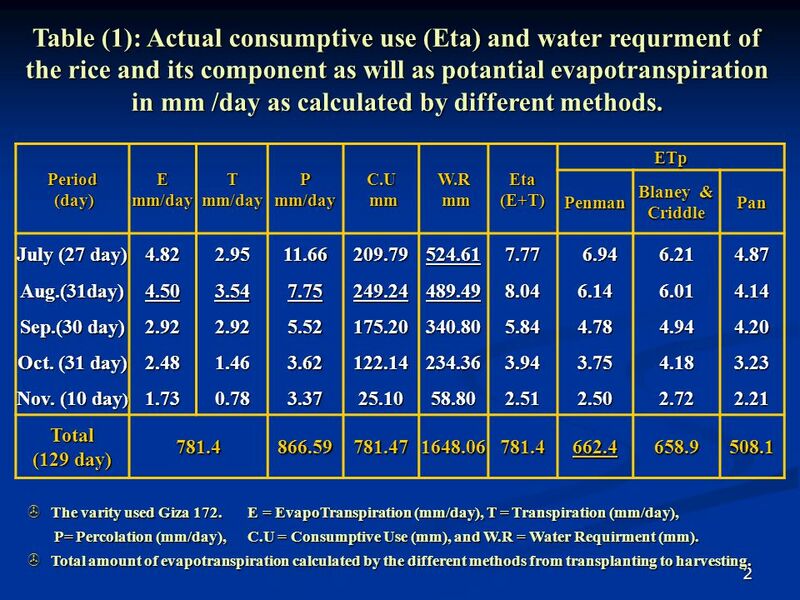 Total amount of evapotranspiration calculated by the different methods from transplanting to harvesting. 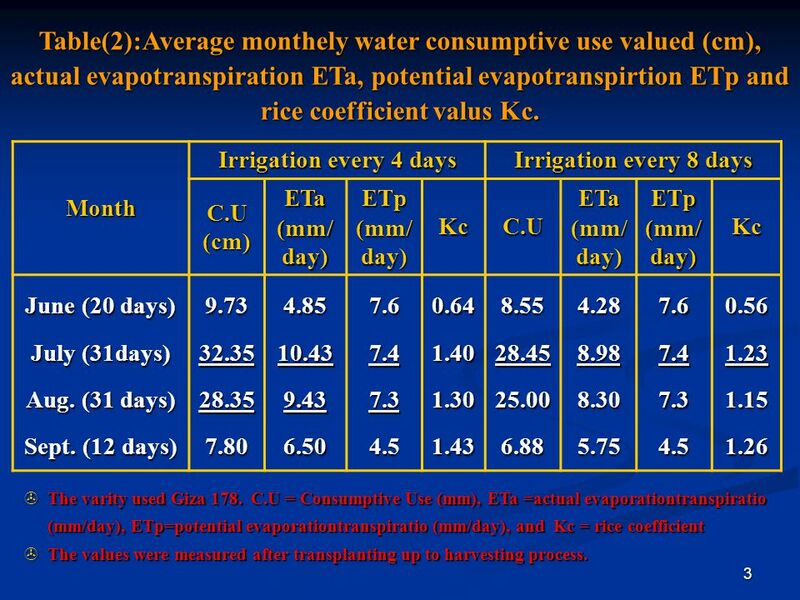 3 Table(2):Average monthely water consumptive use valued (cm), actual evapotranspiration ETa, potential evapotranspirtion ETp and rice coefficient valus Kc. Irrigation every 8 days Irrigation every 4 days Month Kc ETp (mm/day) ETa (mm/day) C.U (cm) 0.56 1.23 1.15 1.26 7.6 7.4 7.3 4.5 4.28 8.98 8.30 5.75 8.55 28.45 25.00 6.88 0.64 1.40 1.30 1.43 4.85 10.43 9.43 6.50 9.73 32.35 28.35 7.80 June (20 days) July (31days) Aug. (31 days) Sept. (12 days) The varity used Giza C.U = Consumptive Use (mm), ETa =actual evaporationtranspiratio (mm/day), ETp=potential evaporationtranspiratio (mm/day), and Kc = rice coefficient The values were measured after transplanting up to harvesting process. 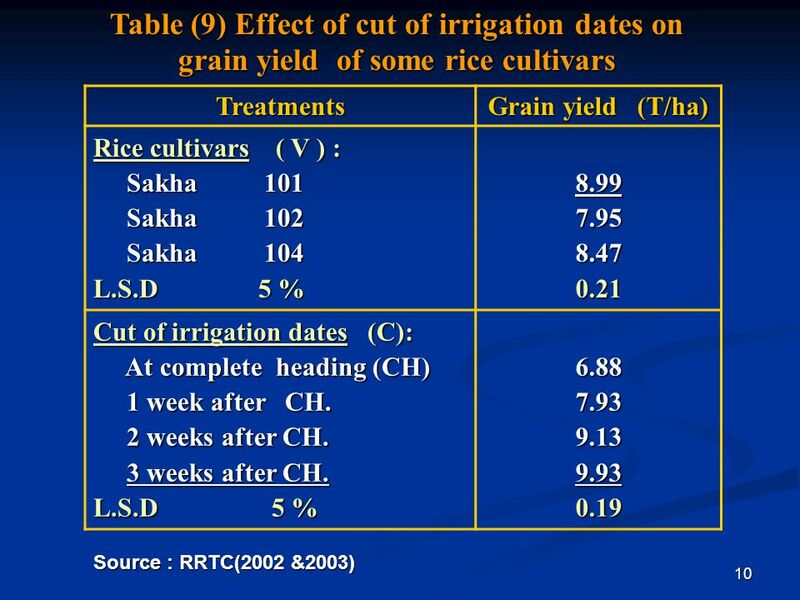 4 Table(3) :Some water relations for some rice varieties as affected by irrigation treatments. 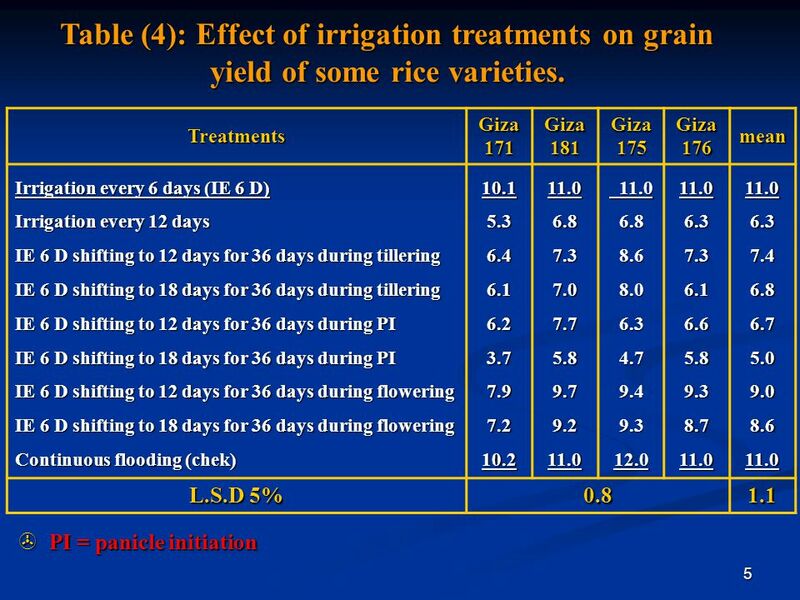 5 Table (4): Effect of irrigation treatments on grain yield of some rice varieties. 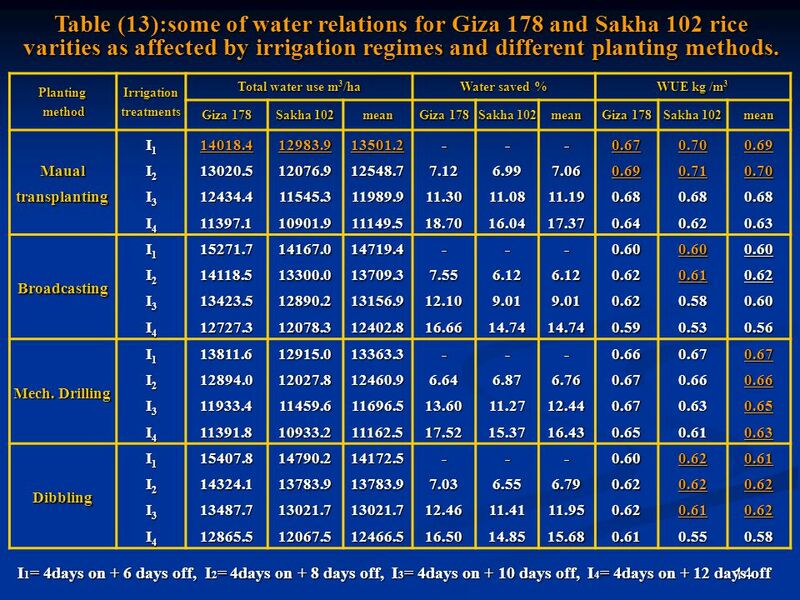 Table(7):Water used, water saved and water use efficiency of some rice varieties as affected by water regime Water Relations Treatments Water use efficiency (WUE) Water saved % Water used m3/ha* 0.68 0.51 0.72 0.66 - Continuous Flooding: Giza 182 Egyptian Jasmine Sakha 103 Sakha 104 0.64 Mean 0.88 0.65 0.86 25.69 23.90 18.96 Continuous Saturation: 0.81 23.56 0.69 0.53 0.74 0.67 7.80 8.70 8.25 Irrigation every 6 days: 8.14 0.77 0.48 0.70 23.21 14.06 17.67 Irrigation every 9 days: 19.54 Including the amount of water used before applying treatments ( through nursesries and land preparation) RRTC (2001). 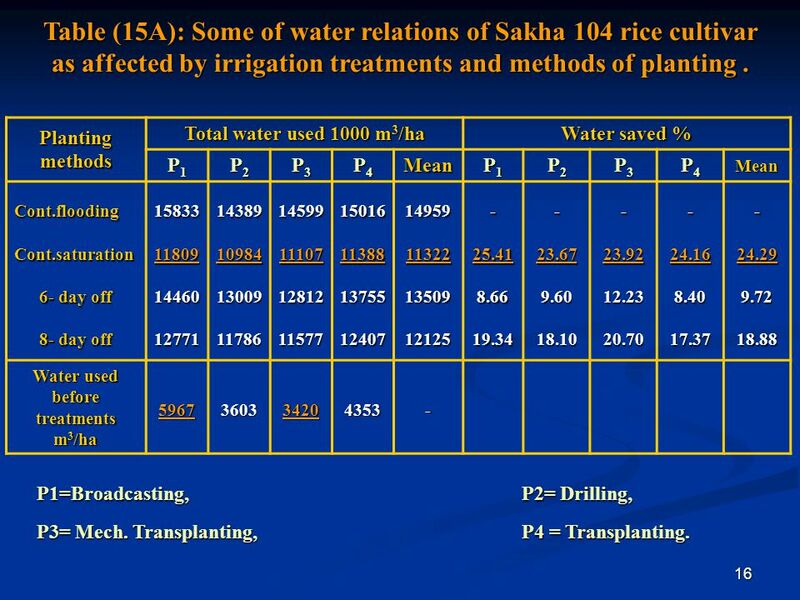 Table (15A): Some of water relations of Sakha 104 rice cultivar as affected by irrigation treatments and methods of planting . 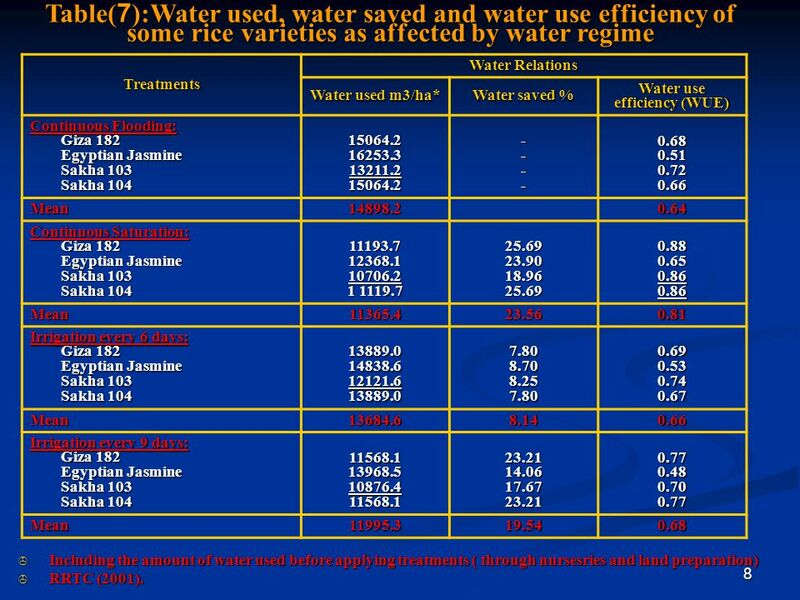 Water saved % Total water used 1000 m3/ha Planting methods Mean P4 P3 P2 P1 - 24.29 9.72 18.88 24.16 8.40 17.37 23.92 12.23 20.70 23.67 9.60 18.10 25.41 8.66 19.34 14959 11322 13509 12125 15016 11388 13755 12407 14599 11107 12812 11577 14389 10984 13009 11786 15833 11809 14460 12771 Cont.flooding Cont.saturation 6- day off 8- day off 4353 3420 3603 5967 Water used before treatments m3/ha P1=Broadcasting,	P2= Drilling,	P3= Mech. Transplanting,	P4 = Transplanting. 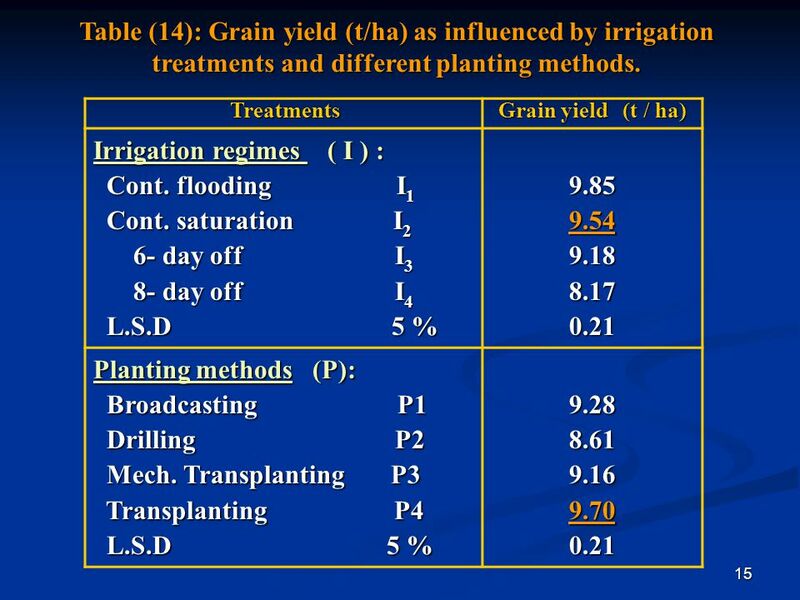 17 Table (15 B): Grain yield (t/ha) as influenced by irrigation treatments and different planting methods. WUE Kg /m3 Yield reduction % Planting Mean P4 P3 P2 P1 methods 0.66 0.85 0.68 0.70 0.89 0.72 0.67 0.86 0.71 0.82 0.65 0.63 0.81 - 3.11 6.91 17.06 3.15 5.35 21.10 1.44 5.89 13.65 3.53 8.24 19.59 4.33 8.15 13.88 Cont. flooding Cont. saturation 6- day 8- day 0.75 0.74 0.69 P1=Broadcasting,	P2= Drilling,	P3= Mech. Transplanting,	P4 = Transplanting. 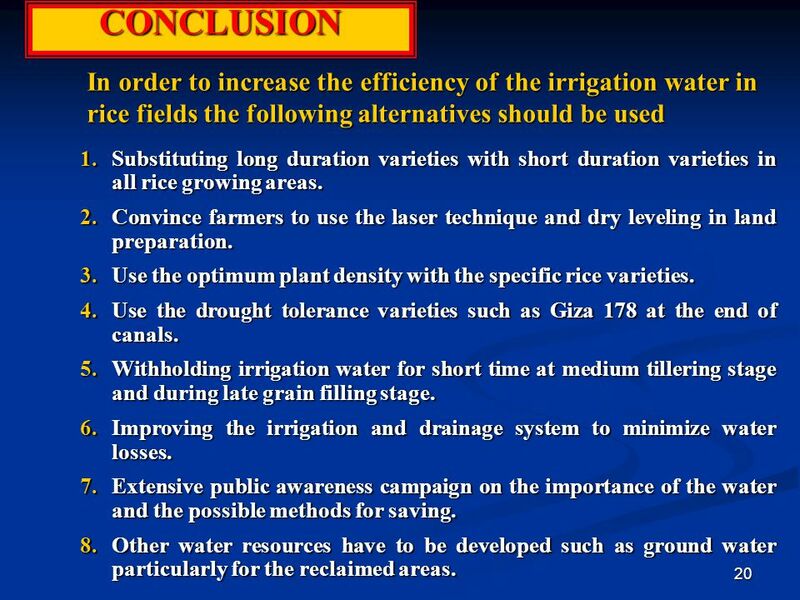 20 CONCLUSION In order to increase the efficiency of the irrigation water in rice fields the following alternatives should be used Substituting long duration varieties with short duration varieties in all rice growing areas. Convince farmers to use the laser technique and dry leveling in land preparation. 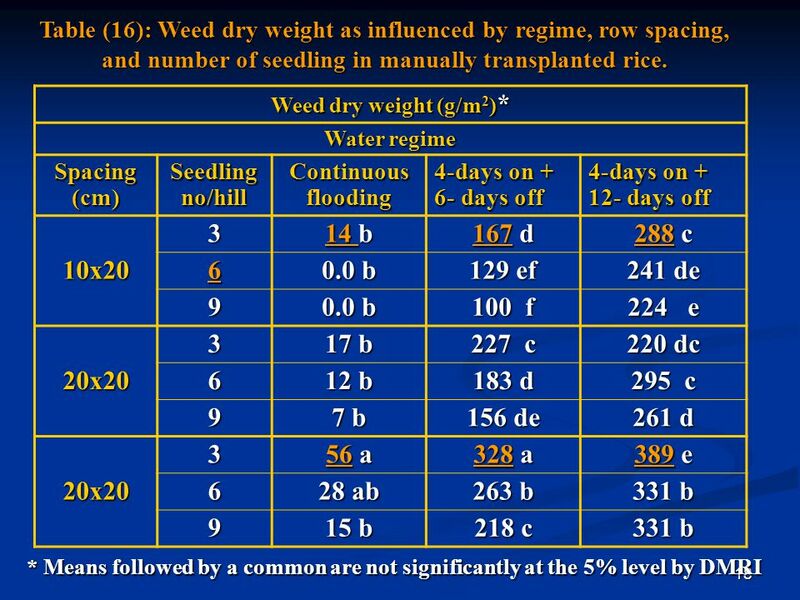 Use the optimum plant density with the specific rice varieties. 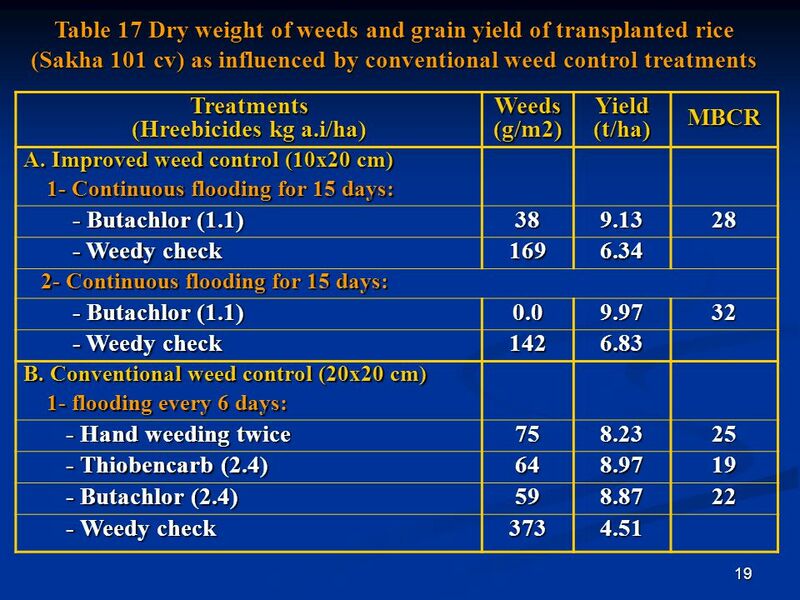 Use the drought tolerance varieties such as Giza 178 at the end of canals. 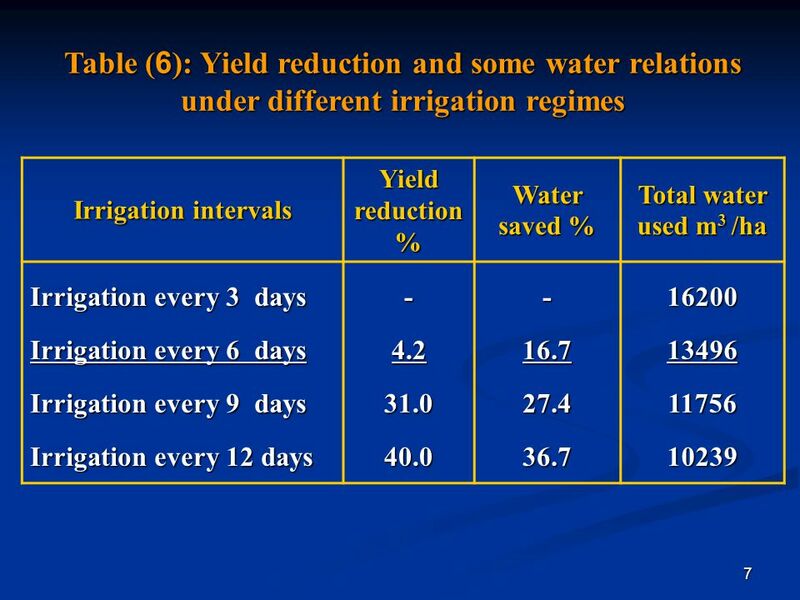 Withholding irrigation water for short time at medium tillering stage and during late grain filling stage. Improving the irrigation and drainage system to minimize water losses. 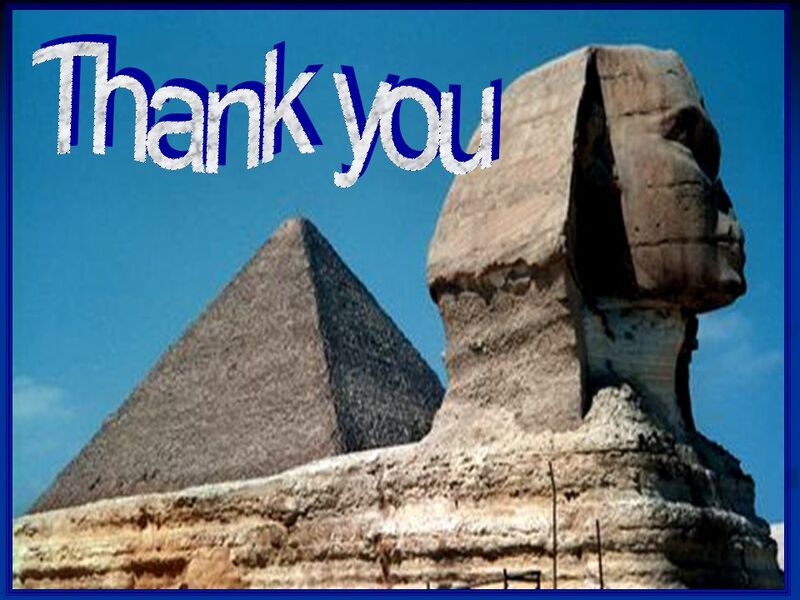 Extensive public awareness campaign on the importance of the water and the possible methods for saving. Other water resources have to be developed such as ground water particularly for the reclaimed areas. 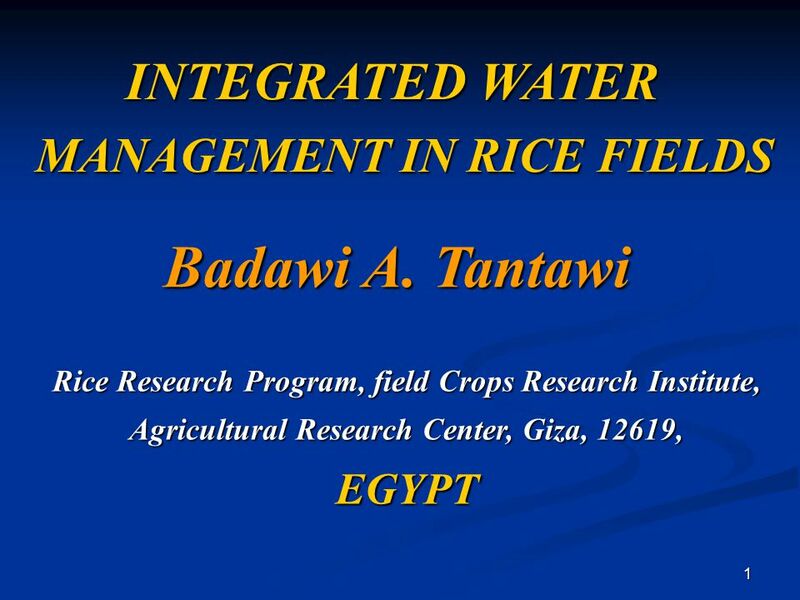 Download ppt "Badawi A. Tantawi INTEGRATED WATER MANAGEMENT IN RICE FIELDS EGYPT"
INTRODUCTION Kenya is a food insecure Economy reliant on rain-fed agriculture(by a factor of 1.6) Key intervention: irrigation Irrigation challenged by. 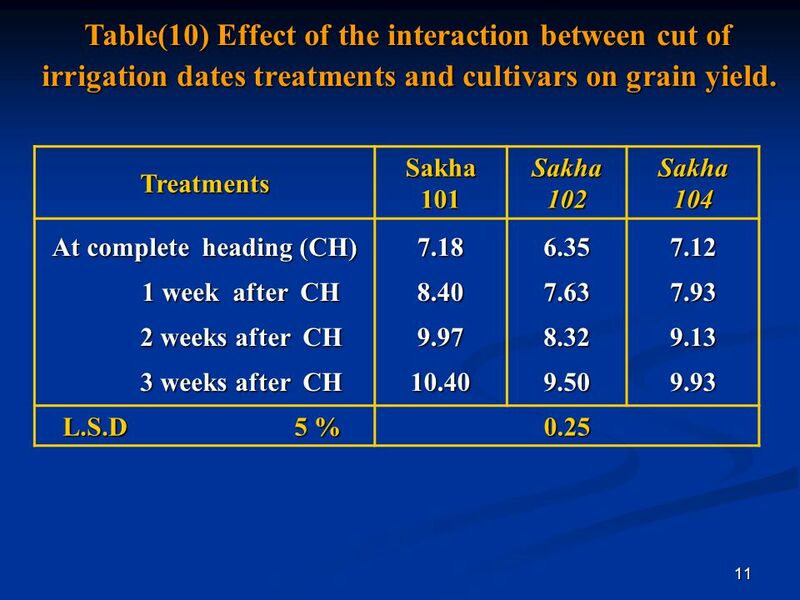 Response of Early and Late Maturing Peanut Cultivars to Sowing Densities and Fungicide Application in Ghana Jesse B. Naab 1, P.V. Vara Prasad 2*, Kenneth. 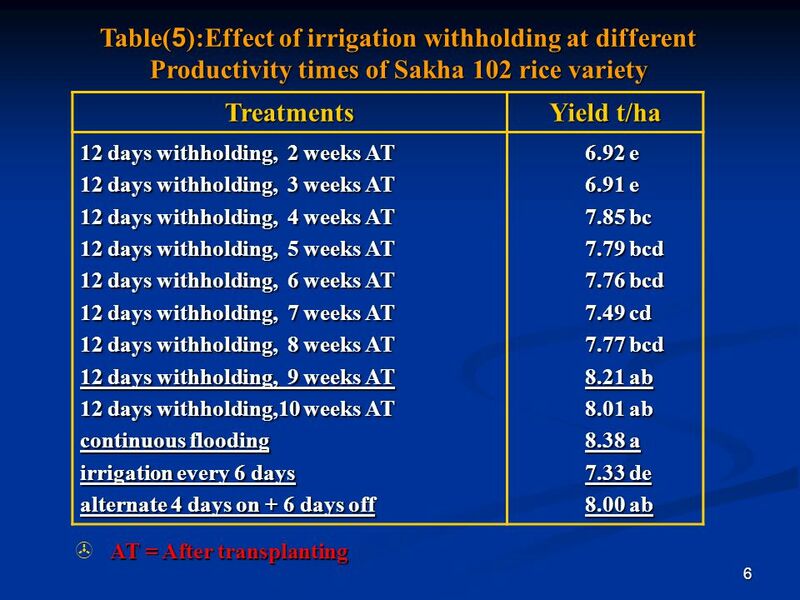 Increasing Irrigation Water Productivity for Rice Crop Presented by M. A. Mahmoud M. A. Mahmoud, Ph.D.
Water Saving in Rice Cultivation. 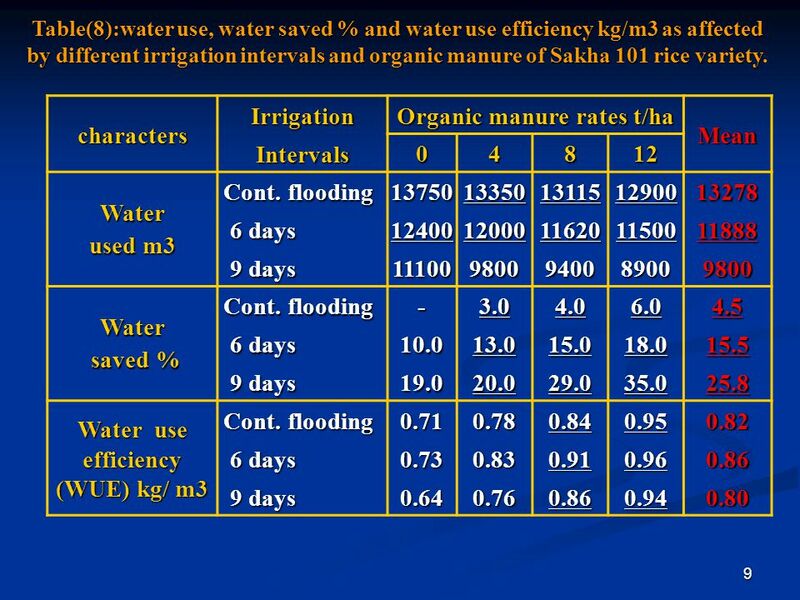 Rice is a water intensive crop. Preferably it is not grown in areas with scarce groundwater resources It remains popular. 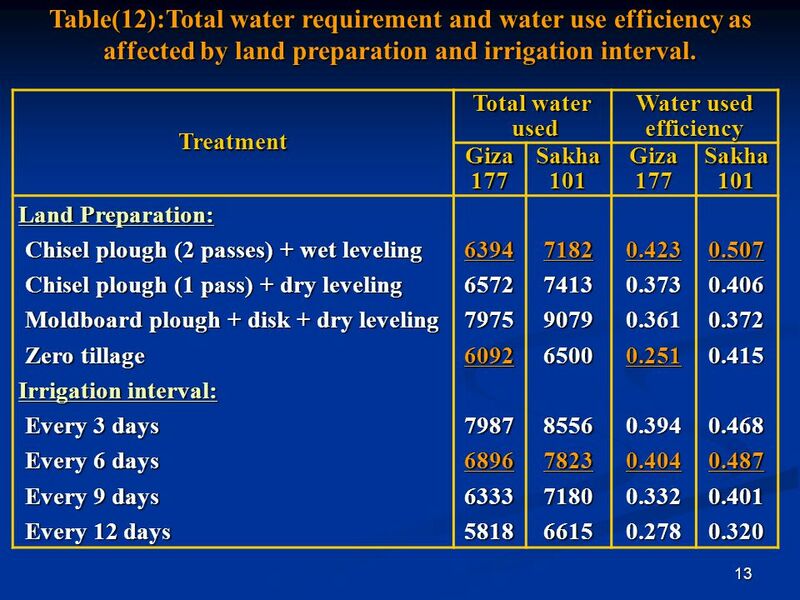 Water Use Efficiency Water Use (technical) Efficiency: The mass of agricultural produce per unit of water consumed Water Use (economic) Efficiency: The. By Dr. Thongchai Tangpremsri by Dr. Thongchai Tangpremsri Thailand Country Report on Conservation Agriculture. 5.3 Sorghum. Sorghum is grown in warm or hot regions that have summer rain-fall, even if rainfall is as low as mm. The most favorable mean temperature. Module VIII: Seeds and Sowing Lesson 3: Sowing of Chili Pepper After completing this lesson, you have learned to answer: 1.Describe the practiced systems. Module X: Soil Moisture Relationships and Irrigation Lesson 1: Soil Moisture Relationships After completing this lesson, you have learned to answer 1.What. 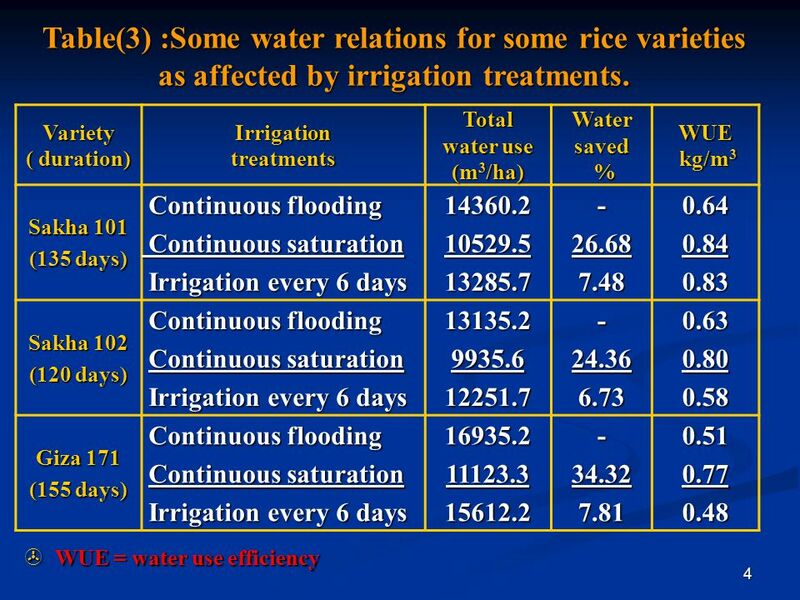 Application to the rice production in Southeast Asia Rice Production Research Program Agro-meteorology Division National Institute for Agro-Environmental. The Nitrogen Requirement and Use Efficiency of Sweet Sorghum Produced in Central Oklahoma. D. Brian Arnall, Chad B. Godsey, Danielle Bellmer, Ray Huhnke. Development of tillering pattern under transplanting and direct sowing methods in spring planted sugarcane M. O. 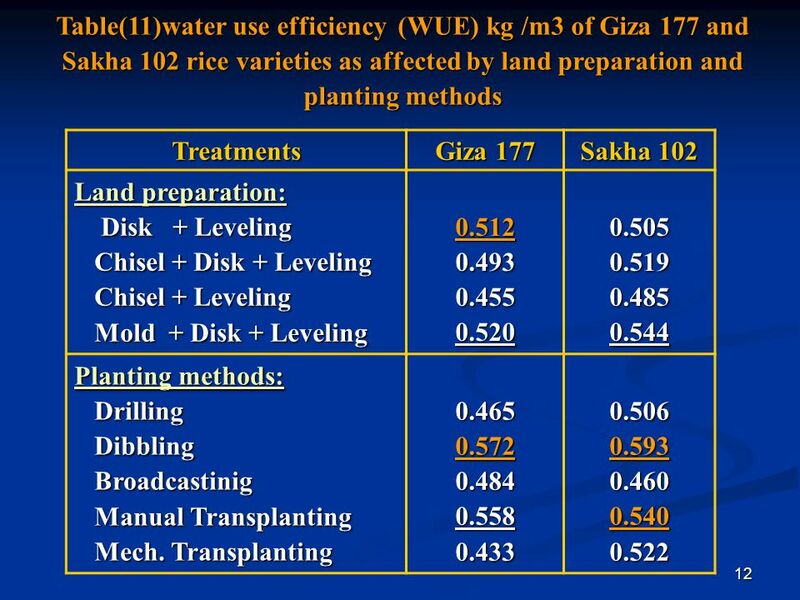 A. Galal *, A. M. Abou-Salama **, E. A.
Tradeoffs in land and water productivity of rice with establishment method and irrigation schedule Sudhir Yadav and Liz Humphreys. Prof. U. P. Singh Department of Agronomy, Institute of Agricultural Sciences, B.H.U. Varanasi, U.P. (India) Wheat Production Technologies for Eastern UP. Machungo C, Wanjogu R.K, Owilla, B , Njoka, J.J Anzwa, M.